Are you catching enough shuteye? Chances are, you’re not. Experts say teens aren’t getting the rest they need, leading to drowsy driving, increased stress and problems at school. Take our quiz to learn more about healthy sleeping habits. Find out if you’re a successful sleeper…or more of a snore. Is it OK to fall asleep watching TV? Your best bet is to switch off the TV before you drift off. Experts say that falling asleep in front of the TV can interfere with your sleeping habits. The flickering light of the television can prevent your brain from relaxing and reaching a deep sleep. Is it a good idea to catch up on sleep by sleeping in on weekends? 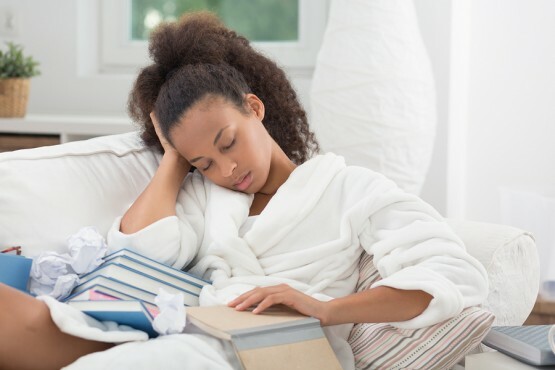 While sleeping in on the weekends might seem like the only way you can catch up on your sleep deprivation, there’s no real substitute for a regular sleep schedule. So even though it may feel great to snooze, be careful not to throw your body clock out of whack on the weekends. Try not to sleep in more than three hours later than you would on a school day. Should you drink coffee or cola after lunch? Drinking caffeine close to bedtime will interfere with your ability to fall asleep. How often should you pull an all-nighter? Staying up all night can have a serious toll on your sleep cycle, so don’t leave tests or papers until the last minute! Should you count sheep to try to get to sleep? Researchers at Oxford University in England say counting sheep can actually hurt your chances of getting rest. Instead, try picturing a more tranquil scene, like a beach or waterfall. If you don’t get enough sleep, your decision-making skills, physical and mental performance, and overall health will all be at risk. How many hours of sleep should you get each night? Eighty percent of teens don’t get enough sleep, according to the National Sleep Foundation. Teens need more sleep than adults– experts say that about 8-10 hours of sleep a night will keep you rested. How Much Do You Know About Groundhog Day? I think it is important too try too gain as much sleep as possible to be able to learn an focus. If you don’t get enough sleep for class then you will not be able to gain the focus you need for learning. I mean does anyone care??? I think we should chose how long we sleep, but we should get the recommended time. I like to sleep in on the weekends, but I guess I better set an alarm. If you don’t get enough sleep for at least 9 hours than get to snoozing. for me sleep or no sleep I’m ready for the morning. We should go to sleep at 9 insted of start earlier! The school should start later because it’s good for our brain function and our performance in school would be better. Sometimes I stay up for tests but now I realize that it’s not any better, it can cause you to be even more stressed out. I don’t think there should be no right or wrong answers. People should pick their own opinion. I Agree with Tasha. The questions are opinion questions. We should be able to choose what answer we agree with. I know I don’t get enough sleep, but i am constantly tired, but I try to fall asleep fast it never works. I have deppression and anxienty both,when I cant sleep, my mind wanders to things like that. I will try to get more sleep. “I think its better if we had school at night because at night you don’t want to go to sleep you want to stay up, but in the morning you want to stay home and sleep”. Quiz: Are You a Healthy Eater?